Klapisch’s follow-up to both the hit Pot Luck (L’auberge espagnole) and its sequel Russian Dolls (Les poupées russes) proves yet again that the mix of this quirky style of directing and use of relatable concepts such as encountering new cultures, and all the ups and downs that come with this kind of experience, are still a hit with viewers. Screened at the Glasgow Film Theatre as part of this year’s French Film Festival UK, the audience’s riotous laughter throughout and applause when the end credits appeared would certainly seem to be evidence of this. 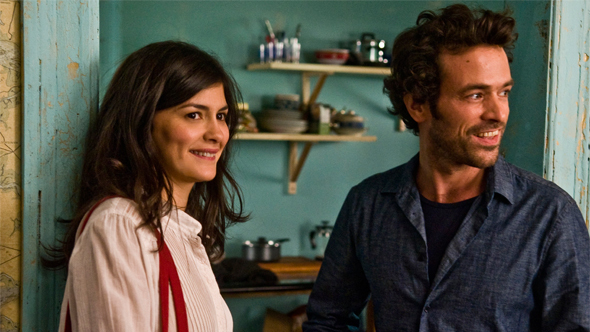 In Chinese Puzzle, the same characters who were once students together on an exchange programme in Barcelona are now turning 40, and at different crossroads in their respective lives. Writer Xavier (Duris) and Wendy (Reilly) have separated and, once she makes the decision to move from France to New York with their children, he decides to start a new life there as well to be closer to them. Xavier’s friend Isabelle (Cecile de France) wants to start a family with girlfriend, Ju (Sandrine Holt) and his ex-girlfriend Martine (Tautou), a single mother, appears from time to time as well. Renting an apartment in Chinatown, Xavier is thrown into a whole new culture as he attempts to find a lawyer cheap enough in order to get through his divorce, continues to write his book, and finds a way in which to obtain his visa. The way the narrative is presented – constantly flicking back and forth between Xavier’s recounting of events, and his present conversation with his editor – mimics this idea of a ‘puzzle’ and the continual theme of confusion. Pleasingly, certain parts of the plot subtly reference the previous films, but even without seeing them, Chinese Puzzle would be enjoyable to watch and easy enough to follow. Although some of the comedy doesn’t always hit quite the right note, certain scenes fuelled by farce and confusion are genuinely funny. Duris’ comedic timing never disappoints, and Tautou’s whimsical and bubbly character is a particular highlight. However, despite a large part being made of farcical elements, the film is also well-balanced with scenes of realistic drama, and some touching moments. All in all, it’s a nice story: generally uplifting and positive, it’s both predictable and completely unpredictable at the same time, much like life, and its complexities.